Ways To Keep Your Valuables Safe | Calgary Alarm Inc.
Keeping your valuables safe does require a bit of innovative thinking. If you want to outsmart seasoned burglars, you have to be one step ahead of them. Here are some unusual but effective ways to protect your valuables. Burglars will routinely look through the places where they know valuables are hidden: drawers, closets, cabinets and even safes. 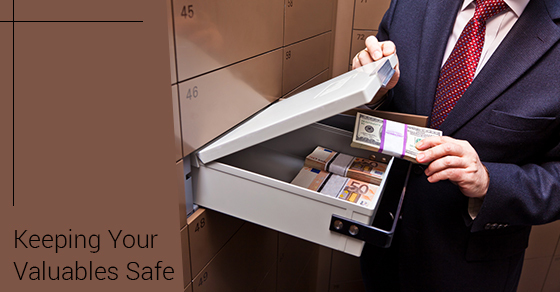 Avoid these places if you want to keep your valuables safe. Books can actually be quite handy for concealing items. Burglars don’t want to be searching through books, plus the appearance of old books will more likely cause them to discount the chances of finding anything valuable. However make sure that the bookshelf has a wide variety of old books on them (uniform books might appear to be fake and prompt an investigation). In addition, keep your bookshelf full so you don’t make it easy for them to check. You can use fake containers that actually mimic those of real brands such as Coca-Cola or Pepsi. A burglar will most likely pass over them, as these are not likely to have anything valuable. The downside is that false containers actually look false, so you might actually want to make your own so they look “real”. The trash is not the first place a burglar would look for anything of value. You can have a false bottom to hide items or place “fake” trash on top of it. Your house plant is also a smart place to hide items. But you will need waterproof lining to make sure your item doesn’t get wet or soiled. This is one of the more ingenious places to hide your valuables. Burglars are unlikely to notice the difference and will miss it. Just ensure that it is not obstructing a real electrical outlet. When it’s dark outside and the lights are on, it’s easy for someone to see through your window without being seen. One solution is to use dark curtains to conceal your rooms at night. It will be much more difficult for a burglar to monitor your house. It is never a good idea to keep large amounts of cash on your person or in your home. Keep your money in the bank or some other financial institution. If your passwords are easy to remember and have not been changed for a long time, you might want to consider changing your current password. Use a variety of characters and numbers, and avoid using your personal information such as your date of birth or name. The best way to keep your valuable safe is to have an effective security system in place. If you don’t yet have it, then consider contacting us for a free consultation.